For the naïve mind there is something miraculous in the issuance of fiat money. A magic word spoken by the government creates out of nothing a thing which can be exchanged against any merchandise a man would like to get. How pale is the art of sorcerers, witches, and conjurors when compared. Another month, another purchase of tons of gold. 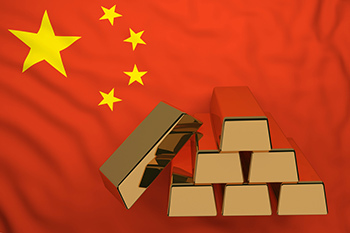 China continued its gold buying spree in March. It added 360,000 troy ounces of gold to its reserves. That’s 11.2 metric tons. In one month. It’s the fourth month in a row that China has beefed up its gold stock. In February it bought 9.95 tons, in January 11.8 tons, and in December 9.95 tons. China is also the world’s top gold producer. China is serious about gold. Last year the world’s central banks added 651.5 tons of gold. It’s reached the point where I have to describe central bank gold buying as a megatrend. As with most financial megatrends, the mainstream media usually misses its significance until much later. What is behind the megatrend? It is a move away from the US dollar. Some years ago, in congressional testimony, Federal Reserve chairman Ben Bernanke was asked by Ron Paul why central banks own gold. Bernanke had to come up with something. He thought fast. “It’s tradition,” he answered. Like so much else, he had that wrong, too. Central banks hold gold because it is money. They hold dollars because of tradition. The tradition became institutionalized with the international Bretton Woods agreement after World War II. That agreement broke down decades ago. They have continued to hold the dollar in the belief that it’s “the cleanest dirty shirt.” All paper currencies are flawed, although they viewed the dollar is the best of a bad lot. But with Bernanke’s Quantitative Easing, central banks are slowly realizing that they don’t want any dirty shirt. If the Fed can conjure up trillions of dollars out of nothing, maybe they better get out of the way. Because even the best of a bad lot is still bad. Central bank gold buying is a megatrend for a reason. The prognosis for the dollar is negative.